Six Scottish windfarms were paid up to £300,000 to stop producing energy, it has emerged. The turbines, at a range of sites across Scotland, were stopped because the grid network could not absorb all the energy they generated. Details of the payments emerged following research by the Renewable Energy Foundation (REF). 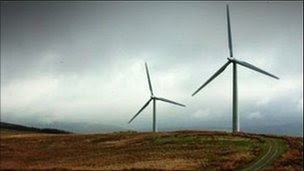 The REF said energy companies were paid £900,000 to halt the turbines for several hours between 5 and 6 April. According to the REF research, the payments made cost up to 20 times the value of the electricity that would have been generated if the turbines had kept running. The largest payment was given to Whitelee windfarm in East Renfrewshire, owned by Scottish Power, which was paid £308,000 in April. The RWE nPower-owned Farr windfarm, south of Inverness, received £265,000 in the same month. Hadyardhill in South Ayrshire, which is owned by SSE Renewables, was given £140,000 to stop producing energy, while Blacklaw windfarm in Lanarkshire - also owned by Scottish Power - was given £130,000. The Millennium windfarm in the Highlands and Beinn Tharsuin, just north of Alness, each received £33,000 and £11,500 respectively. Dr Lee Moroney, planning director for the REF, which has criticised subsidies to the renewable sector in the past, said: "The variability of wind power poses grid management problems for which there are no cheap solutions. "However, throwing the energy away, and paying wind farms handsomely for doing so, is not only costly but obviously very wasteful. "Government must rethink the scale and pace of wind power development before the costs of managing it become intolerable and the scale of the waste scandalous." The National Grid said the network had overloaded because high winds and heavy rain in Scotland overnight on 5 and 6 April produced more wind energy than it could use. Spokesman Stewart Larque said: "One of our key roles is to balance supply and demand for energy." He added: "On the evening of the 5th into the 6th of April, the wind in Scotland was high, it was raining heavily, which also created more hydro energy than normal." Mr Larque said a transmission fault in the system meant the surplus energy could not be transferred to England and so generation had to be cut. He also confirmed that the National Grid spent £280m balancing supply and demand. A spokesman for the Department for Energy and Climate Change (DECC), described the incident as "unusual" and said more electrical storage was needed. He added: "In future we need greater electrical energy storage facilities and greater interconnection with our EU neighbours so that excess energy supplies can be sold or bought where required." A Scottish government spokesman said electricity generated by renewables accounted for 27.4% of Scotland's electricity use. He added: "National Grid is responsible for balancing the supply of electricity from all sources across the grid to match demand and generators will sometimes be required to reduce output as part of that process. "At the same time, the Scottish and UK governments have been working with the National Grid and others in the industry to strengthen grid capacity and address access constraints."